Jump Into The Summer With These Fun Games..
RING AROUND THE ROSY... A fun version of the game played on the ground. Form a circle in the middle of the trampoline. Can hold hands, or walk around in a circle. Chant, "Ring Around the Rosy, a Pocket Full of Posies, Ashes, Ashes, We all Do A ________________." Each person takes a turn picking the way you should fall down. Examples include: Bottom drops, knee drops, backwards drops, etc. You can get even more creative by doing animal drops, airplane or train drops, and more. **Recommended for little jumpers up and 3 or more people. CROSSFIRE... A fun version of dodgeball. Two people are up on the trampoline while the rest of the team is on the ground around the trampoline. A soft ball is thrown at the people on the trampoline from the people on the ground. If they hit that person with the ball, they switch positions, and the person they hit then goes to the ground. Points are earned when players on the ground successfully tag someone up on the trampoline. Can go to 10 points, or 20 depending on how many people are playing. For more intense play, use two soft balls. Points are taken away if you tag someone on the head. **Recommended ages 8+ with a minimum of 6 people playing. HOT POTATO... Four jumpers are on the trampoline. All players must be jumping at all times. A soft ball is thrown between players. Players must catch the ball. If they drop it, fail to catch it, or stop jumping to catch the ball they are out. Play continues until there is only one player left. **Recommended for players 5+ with a minimum of three players. Four or more is most recommmended. CRACK THE EGG.... All players are up on the trampoline. One player is chosen to sit in the middle of the players who have formed a circle around her. The player in the middle sits with knees drawn to chest and arms around her knees. Players jump around her until she "cracks" or releases her arms from around her legs. **Recommmended for ages 5+ with a minimum of three players. BASKETBALL... 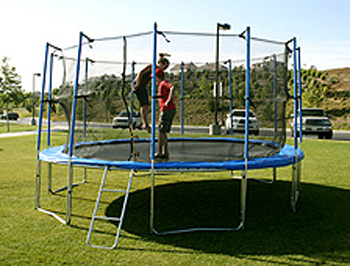 Play a game of jumping basketball while on the trampoline. For younger children, you can use your Fisher Price Grow-to-Pro basketball hoop. Slide it up to the side of the trampoline, set it to six feet, and your children will have a blast playing basketball. Or, use one of the recommended trampoline hoops that easily attachs to the trampoline. . **Recommended ages 3+ with a minimum of two or more players. GAME PACK... It includes a book with over 20 trampoline games to play for one player or more that help build endurance, stamina, and balance. In addition to the book, it comes with 3 squishy balls, 4 shock cords, and 1 box of sidewalk chalk. . **No recommended ages were given on website description. GO CAMPING...Pick your budget and enjoy a night of backyard camping on your trampoline. Grab the whole family and head to the backyard to spend the night in this sturdy, weather resistant tent that fits over the entire trampoline! Definetely the king of all trampoline tents. **Recommended ages: 3+ with parent supervision. BOUNCEBOARD: A fun product for your older bouncers. The bounceboard is great for helping to practice your skateboard, skiing, or water sport tricks. Made out of soft foam, this is a great gift for your older bouncer. . **Recommended ages 8+. Designed for one person. HOPPY BALL: Get hopping! This ball is specially designed for use on the trampoline. Sit on the ball, and start hopping! . Use only on enclosed trampolines. **Recommended ages 5+, one jumper or more. Maximum two bouncers at a time.